Glue the blueprint to a piece of cardboard. Align cardboard corrugation/texture direction. Cut through all orange lines. Fold the mountain and valley fold lines. Maintain 90 degrees for the mountain folds. Tip: Use the edge of the desk to fold straight. Tape the two panels together in the back. (QR code on the right side). Match staple marks and apply glue and staples to assemble the handle. Check if two panel is flat when you pull the trigger. And in 30~45 degrees when you release the trigger. Apply an optional tape as illustrated if the trigger is sliding too much. Download and print out RealControl's blueprint from here. Glue the paper to a piece of cardboard. Put all pieces together as illustrated. And done! If you are using VR viewer like Google Cardboard 2.0, please trim the front cardboard piece to allow your phone camera to see through and be able to recognize the RealControl marker. Due to the variety of VR devices, some Cardboard VR apps would need you to tab the screen or press a mechanical button. If you Cardboard viewer doesn't have that, simply cut a tabbing window (1 inch x 1 inch) at the bottom of the viewer then stick your thumb into it to tab the screen directly. Weird, isn't it? It is actually a common method in many 3rd-party Cardboard viewers. *** You don't need tabbing window to run apps from Realiteer, because we feel that this input method is quite awkward. You only need to cut the tabbing window if you want to run VR apps from other developers. Google has officially retired the magnet button. Don't worry if you lose your button or your viewer doesn't come with one. Use the tabbing window instead. Smartphones come in different sizes and thickness, so there is no Cardboard viewer that can fit them all. However, i is easy to modify the viewer so it can fit your phone better. If your phone is bigger than the viewer, add two extra creases to the cover as illustrated to create additional room. 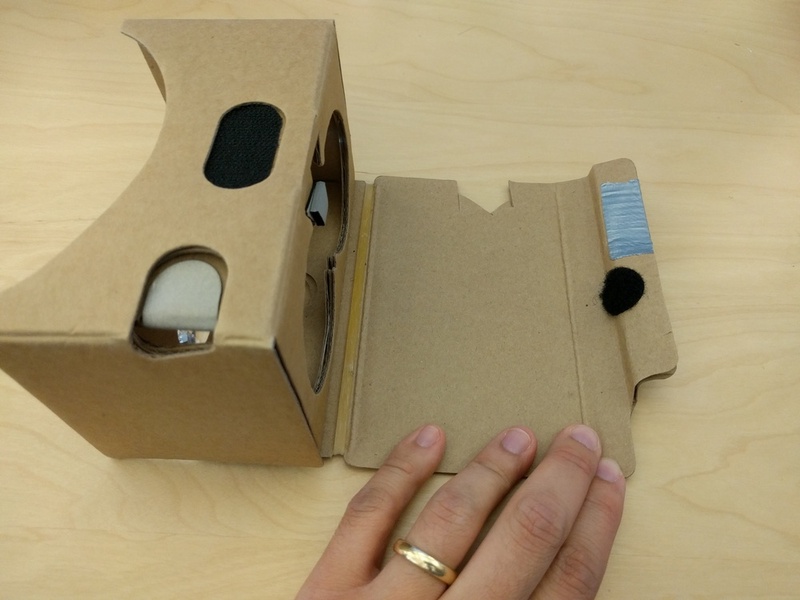 NFC is not necessary to run Cardboard VR apps. If you wonder why you see a NFC tag on some viewers, it is used to tell the phone that it has been inserted into a VR viewer and automatically launch Cardboard apps. However, must users found that annoying and actually prefer launching VR apps manually. Can I fold my Cardboard VIewer? (1) Poke the lens plate out of its socket and fold the right side and left side wall in half. (2) Push down the fold in flat.